Today, and everyday, we appreciate the youth in our surrounding community. They are the next generation of leaders, teachers, friends, and Tola Gallos rugby players. The endless energy, laughs and smiles that they bring to our community events is amazing and they are always keen to have fun and show us how talented they are. At community rugby events or even weekly rugby training there is always a self-organised junior game. From watching their parents and family members play in the Tola Gallos team they have picked up new skills and new team mates. 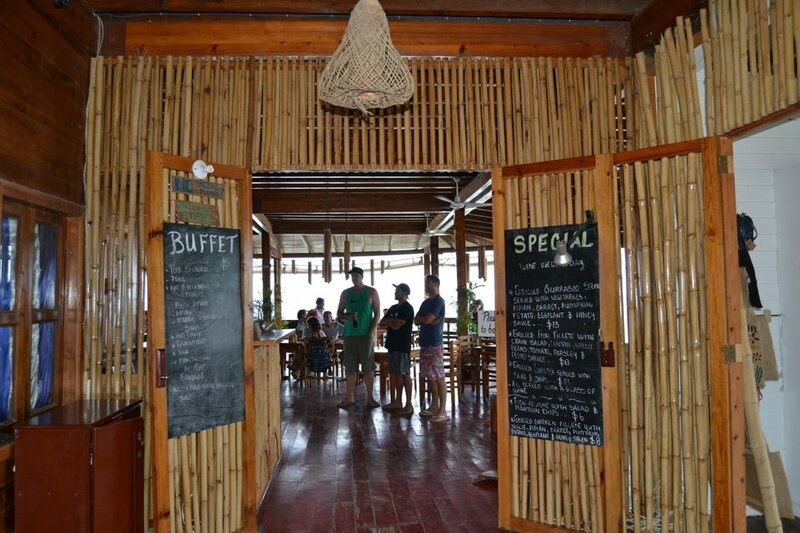 have hosted numerous retreats here at Magnific Rock and always involve the youth in community yoga and performances. They never fail to amaze us at their desire to learn new skills and have fun while doing it. We continue to learn from the youth of today and admire their fresh, positive outlook. When was the last time you did handstands on the beach? Or laughed so hard you fell over? Why is it termed a bad thing to be 'childish'? It seems pretty great to us! The FIFA World Cup has been surprise after surprise, and at times emotions have run high. Every game has seen people cheering for both sides and jumping around the restaurant shouting GOOOOAAAALLLLLLLLL. 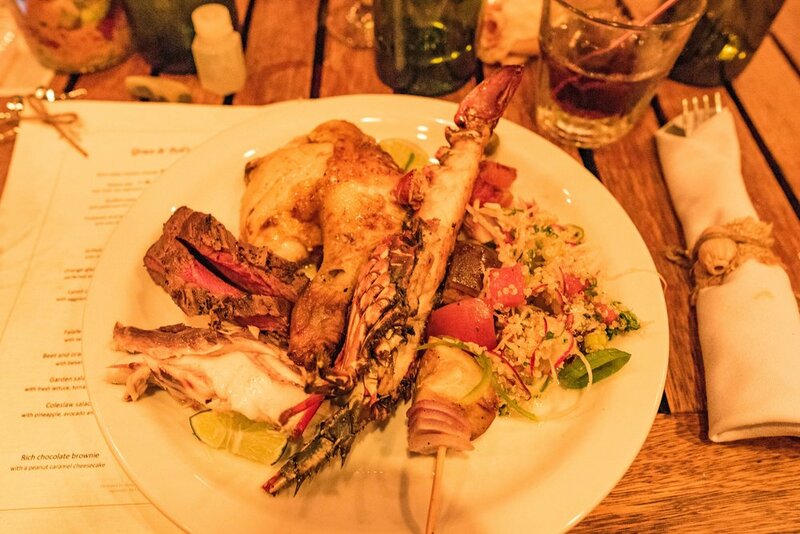 We have been jumping for joy over the football but also over the awesome daily buffets we have been enjoying. 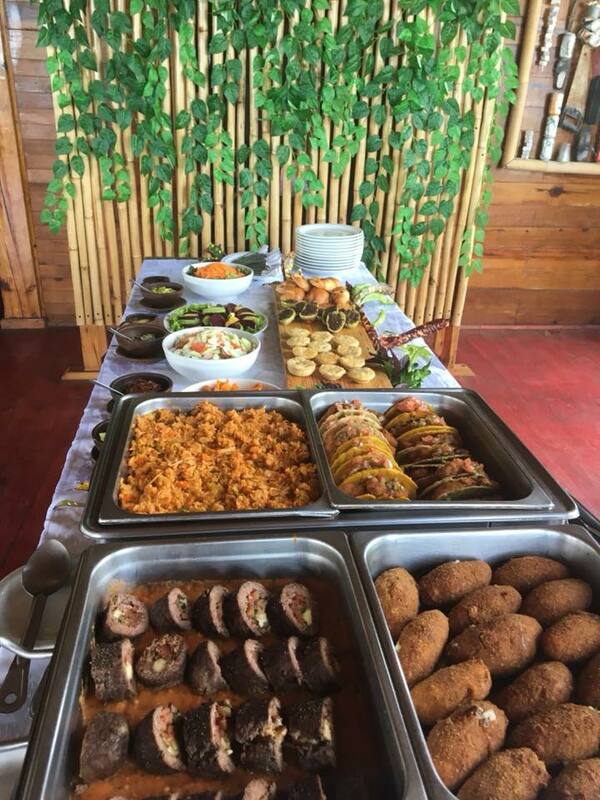 The restaurant has produced amazing new selections every day from fresh breads and empanadas, to sashimi and amazing sweet treats too. Each day accompanied by a speciality fresh juice. YUM! What a final! - what a tournament! We are all a bit sad to see the tournament (and the buffet) end but it has been a lot of fun! Magnific Rock has always had a strong connection with the surrounding community and actively organised and promoted a number of community projects. Not only do we want to support our surrounding area, but also allow guests to experience the true beauty of it by meeting and working with its residents. High-up on the agenda are the needs of the local schools. For the past few months the schools have not been receiving their normal state allocated lunch supplies. 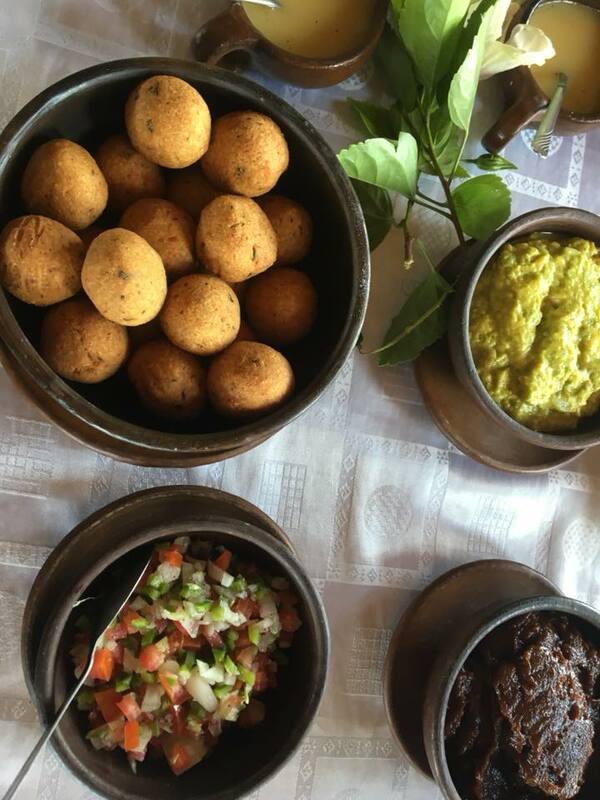 Simple rice and beans that the student’s parents take turns cooking at their homes and bring in to the schools the following day. Something so simple that has a massive impact on the daily lives of over 1000 students in the area. Our goal is to raise $20,000 to provide 9 local schools with supplies for lunches for 1180 students for 3 months. This means that with a donation of just $17 you can feed a student for that entire time. We hope that within 3 months things will be resolved and supplies will again be provided to the schools through the state program. While watching the current rugby test matches we are looking back at the awesome time we had in May when Canada's Rugby Howlers came to visit. A massive thank you to the Howlers team for bringing a great standard of rugby, and a super generous amount of gifts and donations for the local community. Over 400 pairs of rugby boots were distributed to different clubs in the country. Also; clothes, school supplies, medical supplies and much more was given to the local clinics, schools and families. It was a non-stop week of working with the community and fitting in rugby every other minute. Both the Howlers men's and women's teams narrowly came out on top against our local Tola Gallos as well as some other teams in the country. Our local teams stepped up to the challenge and are now busy training to re-gain victory during the Howlers next visit. Howlers - You have huge hearts and us here at Magnific Rock and the surrounding community were so happy to have you, and can't wait to welcome you next time! A HUGE thank you to everyone who came to the beach clean up with Magnific Rubbish Club on Tuesday!! We had over 9 people and 7 full bags of garbage collected… and some delicious smoothies afterwards. 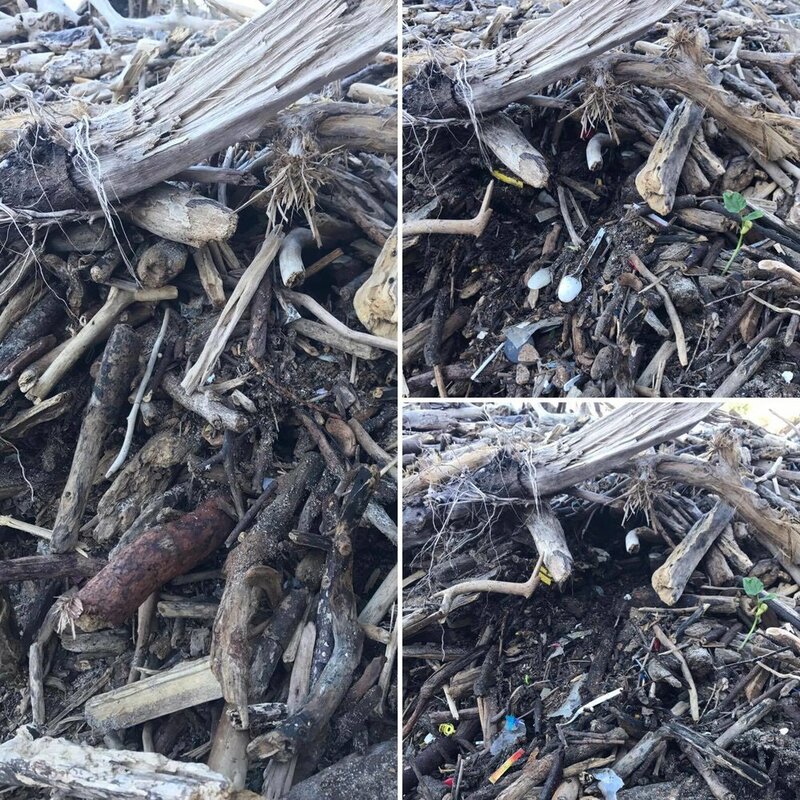 "We will always have problems, many of them hidden from our view"
As the picture shows, we had to remove the outer layer of driftwood to reveal the trash buried underneath. Even though the garbage doesn’t seem obvious at first, it is there, and with an awesome team we are able to prevent it from entering back into the ocean. Every straw you see and pick up helps the world. It was such a pleasure to meet people in the area - some on holidays and some living here. We look forward to collecting more with you all and saving the world - one hidden straw at a time! Our first retreat for the new season has come to an end! Thank you Papaya Wellness and Air Fit Charlotte for your positive and adventurous vibes at Magnific Rock this week. They were moving and grooving every minute of everyday. Horse riding, BBQ’s bonfires, learning to surf, soaking up the Magnific sunsets, hiking in Ometepe, zip-lining in San Juan del Sur. Oh, and in their spare time, hanging out in their beautiful their beautiful aerial studio. We’re feeling inspired! Thanks for visiting. CircAsana Retreat coming to town! We’re EXTREMELY happy to announce that CircAsana is coming to Magnific Rock Feburary 5th, 2018. We absolutely love having the CircAsana crew here - they make use of all toys we have! Aerial Silks, Aerial Yoga Studio, Hula Hoops, Surfboards, AcroYoga Mats and even our Aerial Lyra! The first is a 30-hour Aerial Teacher Training, and the second week they are running an amazing Acro & Aerial Creation Vacation Retreat. The Retreat will include a small circus - so if you’re in the area, drop by to watch the CircAsana magic unfold. The CircAsana programs are great to push your limits within a supportive environment. Both have an really great early bird discount, which will save you USD 200 if you register by Dec 1st. 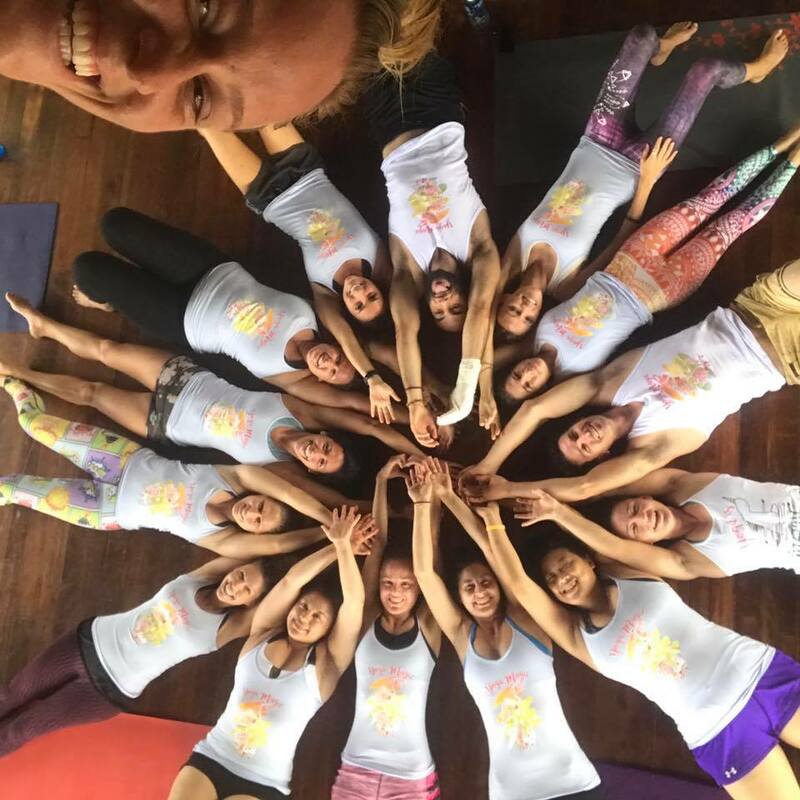 PLUS, if you do both the Aerial Yoga Teacher Training and the Retreat, not only do you get to hang out with the awesome Magnific Rock and CircAsana crew for almost 2 weeks, you will receive an additional $200 off! 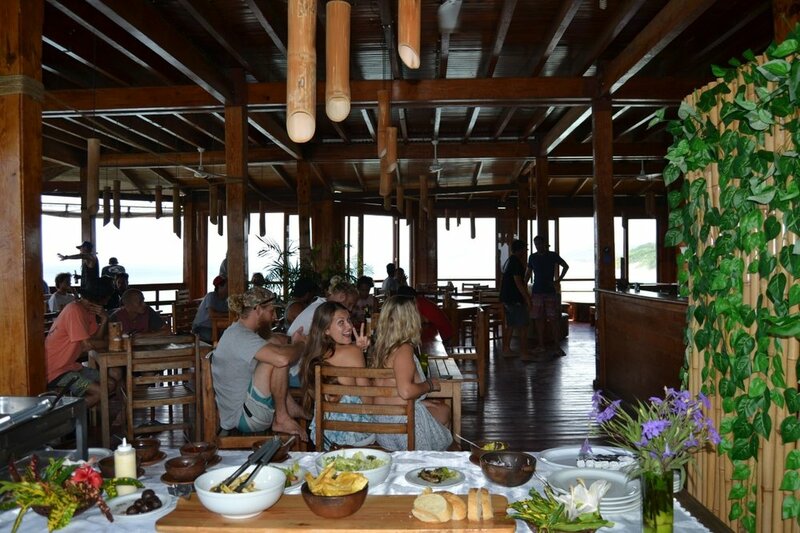 When you come to MagnificRock Hotel, you first think about surf, yoga, great meals and wonderful suits. You are totally right, but do you know that selected Saturday nights, we turn our Rock Bottom bar into a big, beautiful dance floor? The Neon Party was such a great moment shared with people from all around the world. Starting from the sunset happy hour to 3:00 pm, we had the honor to greet the great Dj MGABIT. Around 150 persons were dancing, enjoying our excellent cocktails, chilling in our swiming-pool or three all at the time. We can't wait for the next one, can you? Another wonderful year working in partnership with Surf For Life, newly named Hope Corps. Hope Corps has made incredible progress developing various projects with our local Nicaraguan community. Having previously worked within the local health clinic this year's volunteers renovated classrooms in our local Las Salinas School. The much needed renovation turned the classrooms into mint condition and the kids passion for music was fuelled with new musical instruments brought to the school. Week One saw the help from our Clif Bar team (a good food energy bar company that believes that great food leads to better adventures :) ) A team of pro surfers, snowboarders and videographers smashed through 1 foot thick walls and began the arduous sanding journey. Group 2 arrived to an incredible school reception ranging from the children singing Celion Dione to a reggatone dance-off where all workers where invited to come up and show off there moves. The whole came to see the team produce some fantastic shapes). Group 2 then continued the sanding experience and after 2 interior rooms and the whole exterior of the building the team had triumphed. The occasion musical jam on old instruments and various team riddles made the work a team bonding experience. Our final group, got stuck into painting and bricklaying. Some individuals showed some true natural talent in there ability to adapt to the new job role, others failed misrable. However, after 4 days of hard work, sweat and laughter we where done. A 3 week effort of work complete. The money raised by each of the Hope Corp volunteers and Magnific Rock went into the building materials, local team leaders (who where all incredible) and most improtantly, new equipment for the children. 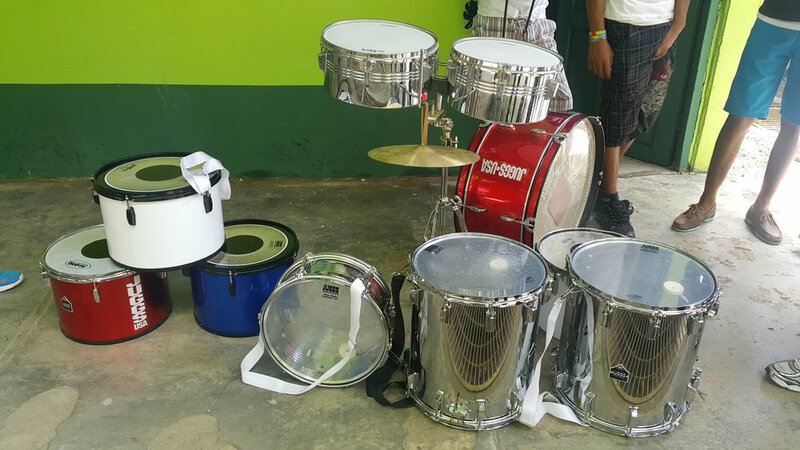 The equipment arrived on the final days of work and the team where blessed by an incredible marching band performance. The children where humble and appreciative and we where humbled by there passion and gratefullness. 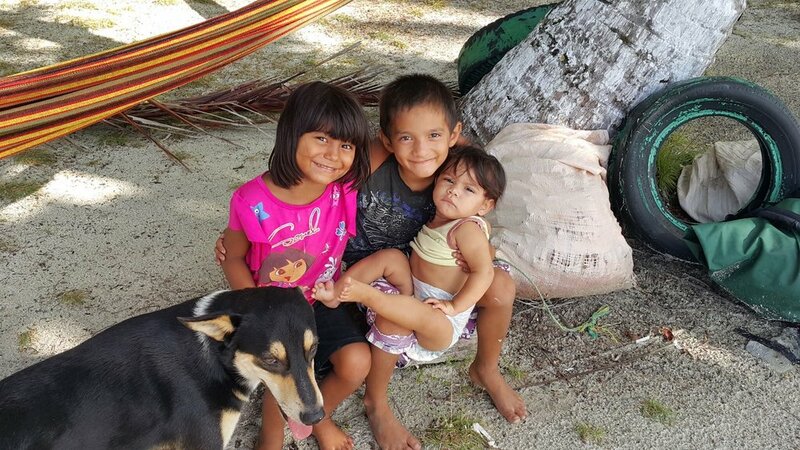 A little help from us certainly went a long way for Las Salinas School. It is safe to say that everyone left inspired and ready to give back to the next community. We were blessed to spend a week with the wonderful non-profit organisation, Guided Good. Guided Good's mission is to empower at-risk young adults exiting the foster care system to serve an international community in need. 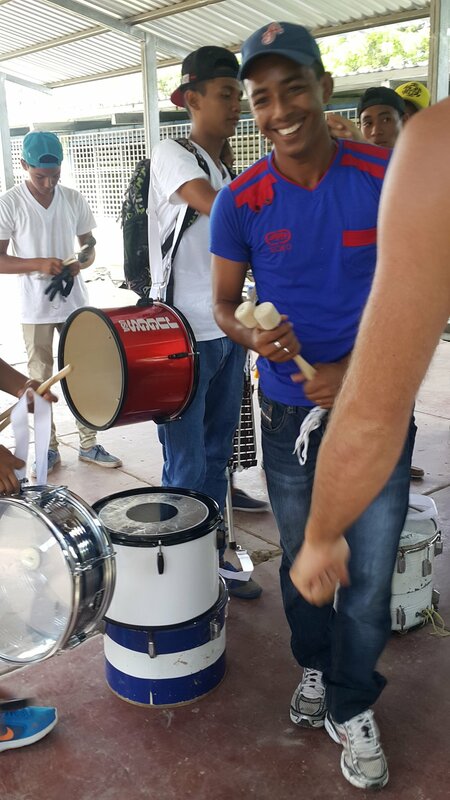 During their time at Magnific Rock the Guided Good team immersed themselves in the diverse Nicaraguan culture. Many of the team had never left the United States before endeavouring on this trip so it was an eye-opening cultural and personal challenge for many. From day one the team rose and challenged themselves. After arriving at thier first computer technology session at the local Las Salinas school, Guided Good were welcome whole-heartedly by 30 young Nicaraguan children. There was one spanish speaker in the group who dug deep to their family roots and oiled their rusty spanish abilities whilst the others improvised with gestures and laughs. The next few days at the school where a tremendous success and the team made a lasting impression on the children. The children left with new found knowledge and understanding of microsoft word, how to send emails and the use of google search. Outside of the school the team discovered many other cultural delights. From learning how to milk a cow, going for a ride in an ox cart and overcoming a fear of heights. The team supported each other through each of these challenges and rose together. 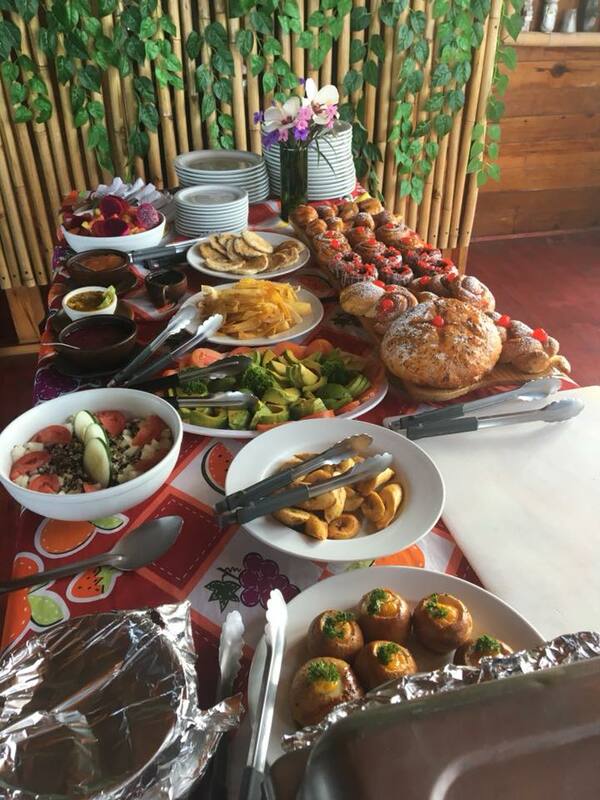 The group left with an appreciation for cross cultural differences and the exciting adventures there are to experience around the world in the future. It was an absolute pleasure to host Grace and Rob's stunning wedding at Magnific Rock in April. With a bit of faith, trust and pixie dust, our team made this event simply magical for the beautiful couple and their families. Grace and Rob holidayed with us a few years prior, and had fallen in love with the beauty of the area, just like us! They wanted to share the experience they'd had with their family, so brought them all down to Magnific Rock for a long weekend of beach relaxation, adventure and one spectacularly stunning ceremony of true love. With Grace and Rob's creative vision, and our team on the ground, we managed to create an event we were really proud of. From the party bus arrival, to the restaurant transformation, intimate beach ceremony with live music, gourmet buffet dinner to dream of (thank you Chef Scotty and his team! ), and one amazing party (with the very entertaining La Furgoneta Giganta band) in our Rock Bottom Bar afterwards, we all enjoyed the experience! Our team took the challenge of creating the event very seriously. The evening before the big event, Luis, one of our superstar bar staff announced, "Oh I feel so nervous - I feel like I'm getting married!" After the event, he followed up saying he could finally relax, knowing the team really had done their best and the guests were smiling. Thanks for coming Grace and Rob, and introducing us to your beautiful families. We wish you all the very best for your future, and look forward to having you down here again at some stage. Thank you @seaturkeyphotos for the photos below, and to Kuba Okon for the great photos he took which you can check out at this link! We were very lucky to host a Thai Massage Training this April, led by the very experienced Thai massage trainer Rebecca Hagman. We had 7 Thai massage trainees with us for the 2 week, 120 hour Yoga Alliance certified training, and very luckily for our guests, they needed plenty of bodies to practice on! It was lovely to see our yoga studio filled with relaxing bodies enjoying hours of Thai massage all the day long. Now, excitingly, we have Thai massage on offer permanently to our Magnific Rock guests. Please contact our Reception team if you'd like to reserve one - we highly recommend! We look forward to hosting more feel good events like this one in future. We are looking forward to the Circuito National Surf Contest 2017, taking place just down the beach from Magnific Rock at the Playa Santana break on the weekend of April 21 and 22. L2 will be throwing an awesome official Surf Contest Party at Magnific Rock on Saturday 22, 2017. This contest marks the start of the 2017 surf season in Nicaragua, and we are very proud to a sponsor of competition and part of the opening festivities. La Furgoneta Gitana band will be playing in our Rock Bottom Bar from 8.30pm to get the party started. Hope you can join us! It was such a pleasure hosting the Soulful Journey Yoga Retreat, with leaders Sarah Weston, Kristie Rose and their group of inspiring American yogis. From the magical mala making, powerful yoga, sweet silks, surfing, sunset sailing and beach bonfire sharing, it has simply been a wonderful week. We feel so lucky to have such beautiful visitors as a part of our Magnific Rock community. Thank you ladies, and look forward to having you back in future! We are busily planning for the approach of Holy Week (called Semana Santa in Spanish) here at the Magnific Rock. Semana Santa is one of the most celebrated events of the year for many Nicaraguans, with processions taking place all over the country. Given the high temperatures, it is unsurprising that visiting the beach, lake or lagoon during Holy Week is also a traditional custom in Nicaragua for the Holy Week period. As such, we are planning plenty of fun for the period at Magnific Rock, with extended happy hours, food specials and music events from Thursday to Sunday. Keep updated on our Facebook page as details are released, and see you there! We very proudly hire over 50 local staff at Magnific Rock, who work day-in and day-out in our kitchen, restaurant, cleaning, maintenance and administration teams. In an effort to improve our overall business operations, our client experiences and the work life of our staff, our administration team recently proposed a new, comprehensive set of employment rules for the team. The Nicaraguan Employment Ministry sent their representatives this week to conduct a 3-hour review and consultation with our staff regarding the rules. We finished the day with everyone in agreement, and are excited to have the new rules approved and in effect onsite soon. We love working towards making our business more professional every day! 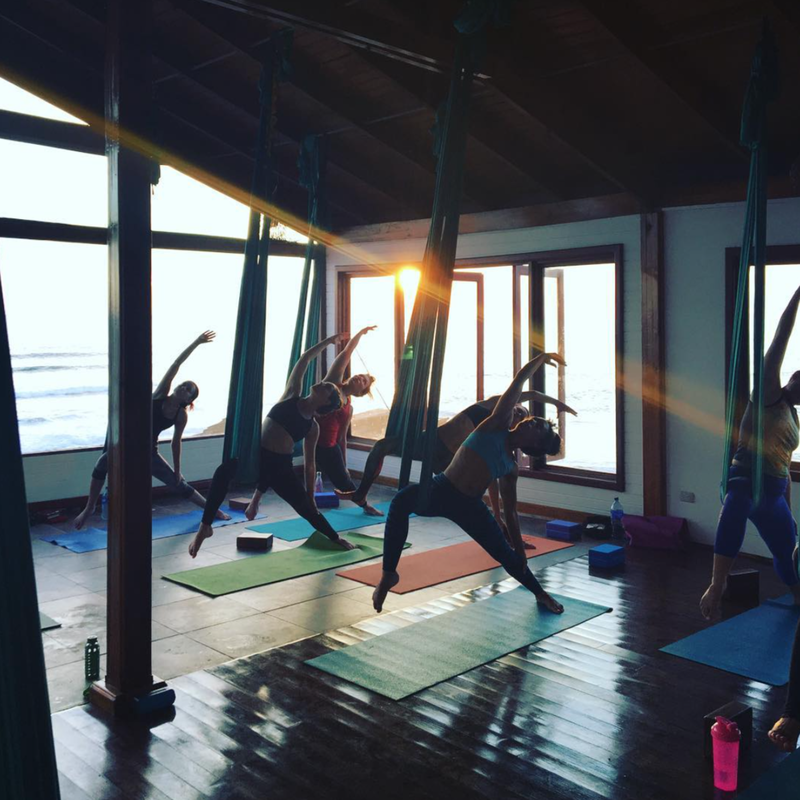 February was a very exciting month at Magnific Rock – we hosted our first corporate yoga retreat and loved it! 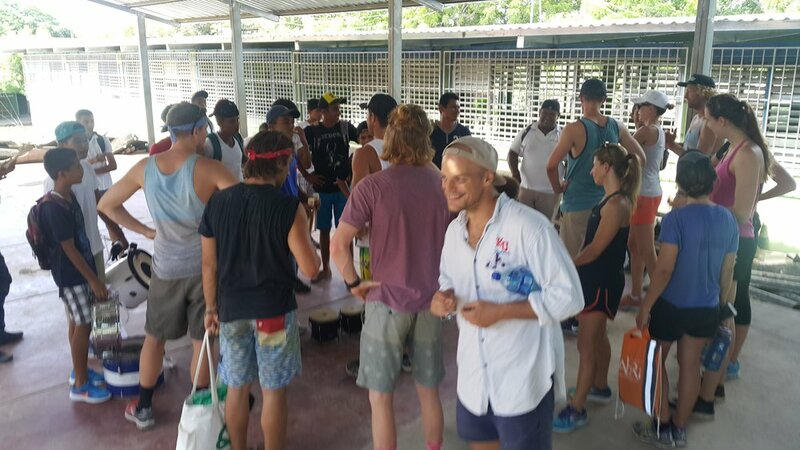 RoadMunk brought their entire office of 25 down from Toronto to practice work-life balance to the fullest extent, complete with surfing, sun soaking, volcano viewing, beach strolling, Rock Bottom Bar dancing, 2 bonfires and a circus! It was really inspiring to share our quarters with a company so focused on growing its healthy corporate culture and living up to its stated values. A real highlight was watching their entire perform in one of our CircAsana community circuses, alongside the budding acrobats and aerialist children from our local area. We have so much love and respect for the entire RoadMunk team, and are excited to see them all again somewhere in this wide world. A unique feature of Magnific Rock is that we regularly host amazing CircAsana community circus performances, in our very own Rock Bottom Bar. In early February, we witnessed a unique show: How to be a Unicorn, the story of a horse who just didn't fit in, and had to journey to find his beautiful, inner Unicorn. The incredible growth in the performing crew, quality of artists and size of the audience is really inspiring to see. The How to be a Unicorn circus had performers traveling from all over the nation, including Managua, Granada and San Juan. There was also a huge array of international professional performers, from Costa Rica, Canada, United States, Australia and Israel. The CircAsana community circus combines professional performers, local children from the area and even Magnific Rock guests who've never performed a day in their life before into a beautiful mash of inspiring, team-working, creative, overall out-of-this-world awesomeness. Makes sure you time your next visit for a show! Thank you @seaturkeyphotos for the great photos! Magnific Rock offers guests the best possible service and amenities you need while maintaining a personal, fun vibe, whether you're here for a yoga class, surf session, bite to eat or a sunset cocktail. Our lodge offers a range of accommodations suitable for that perfect getaway. Please note, all booking deposits are non-refundable.